Garrett first came to House Paws in July of 2018, as a Counselor in Training with the Vets in Training Program. When that program finished, he continued to volunteer at the hospital, and was shocked when Dr. Lisa invited him to join the House Paws staff. Garrett started working at House Paws as a Kennel Technician in November of 2018. After only 6 months on the job, he will be joining the House Paws staff on their mission trip to Mexico to complete a 4-day spay and neuter clinic. 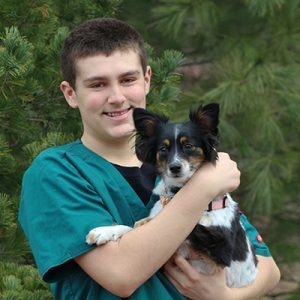 Eager to learn and more than willing to help, Garrett knows that every bit of knowledge he picks up will help him achieve his dream of becoming a Veterinarian. In addition to his work with House Paws, Garrett has volunteered at the Animal Adoption Center in Lindenwold since September of 2014, and helps out once a month with Animal Aid USA’s monthly transport of rescue dogs to shelters in the tri-state area. He has even traveled with the Animal Aid caravan to Georgia on 4 separate occasions, twice coming home with rescue dogs that have since joined his family! Currently a sophomore at Sterling High School, Garrett spends what little free time he has curled up on the couch with his 2 rescues, Leia and Midway, watching the Flyers or some random Netflix series.